Looks like the awesome comic series Batman/Teenage Mutant Ninja Turtles is getting an animated movie treatment! The movie will be out later this year and will be a direct to home release venture and we are actually pretty excited for it. 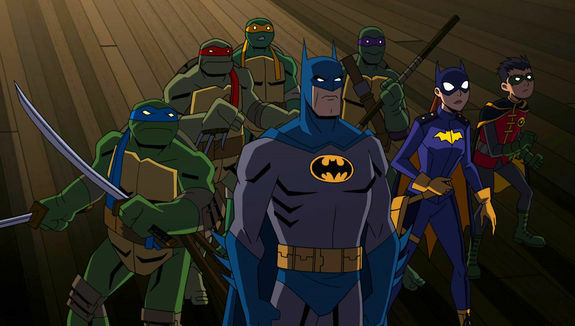 Batman/Teenage Mutant Ninja Turtles The Animated Movie will star Troy Baker as Batman and the Joker along with Darren Criss (Raphael), Kyle Mooney (Michelangelo), Baron Vaughn (Donatello), Eric Bauza (Leonardo), Rachel Bloom (Batgirl), Tom Kenny (The Penguin), John DiMaggio (Mr. Freeze), Tara Strong (Harley Quinn, Poison Ivy), Carlos Alazraqui (Bane), and Cas Anvar (Ra’s al Ghul).